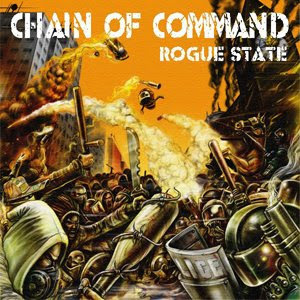 Chain Of Command are essentially a bunch of hot producers, mcs and musicians, straight out of the United Kingdom. In a genre that’s too often American-led this makes a nice change. What’s more, Merciless Records have been brave enough to release material that’s both experimental and plays with more than just superficial, self-conscious imagery – these guys definitely deal in reality. Rogue State is going to appeal to heavier hip hop heads and may also be of interest to some heavy metal punters. Overall, this will probably do best with underground djs. It may be loud, but it’s most definitely proud as well.